These are my favorite Spring Reverb pedals at the moment. There are other types of reverb (plate, hall, ambient, just to name a few) but here I’m primarily talking about spring reverb. The Source Audio True Spring and the Source Audio Ventris Reverb are the most authentic spring reverb pedals on the market at the moment. If you are looking for the most realistic tone, trail and “drip”, these are the best on the market. They are great choices for both clean and overdriven tones. These pedals offer the most customizable spring reverb emulations thanks to not only their controls but also to Source Audio’s app that you can install on your computer, tablet or smartphone and then connect with your Source Audio pedal for detailed tweaking and special features. 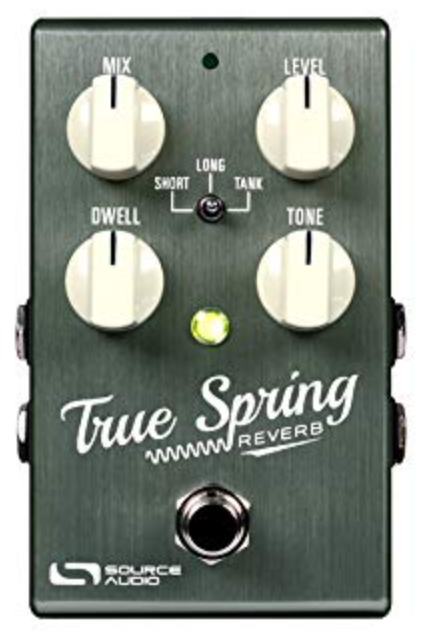 The True Spring includes three spring reverb algorithms: Short, Long and Tank. These allow you to get the precise tones of various amps that have built-in reverb pans as well as the thick, drippy sounds of an outboard spring tank complete with it’s tube preamp. In addition, the True Spring has three exceptional tremolo emulations (Opto Tremolo, Harmonic Tremolo, and Bias Tremolo). You can use the tremolo on its own or in combination with reverb. The Ventris is a stunning “dual reverb” beast which means you can optionally mix two different reverb engines. It includes various other types of reverbs besides spring reverb (hall, shimmer, plate, and more). It has user presets and most every option you might imagine in a professional reverb pedal. It is the current state-of-the-art in reverb pedals. 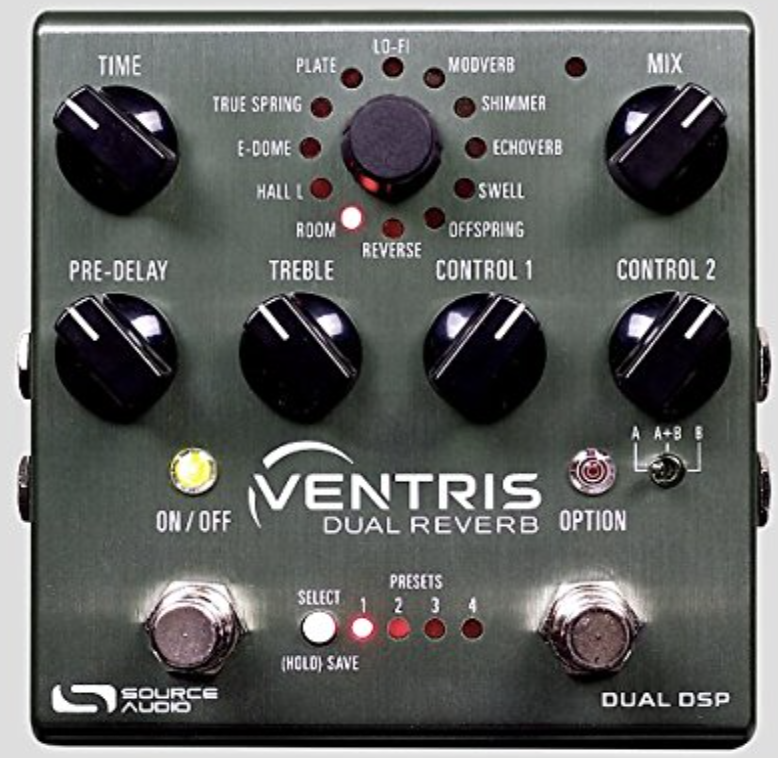 The spring reverb emulations in the Ventris and the True Spring pedals are comparable. The Electro-Harmonix Oceans 11 is a multi-reverb pedal with an exceptional spring reverb emulation. 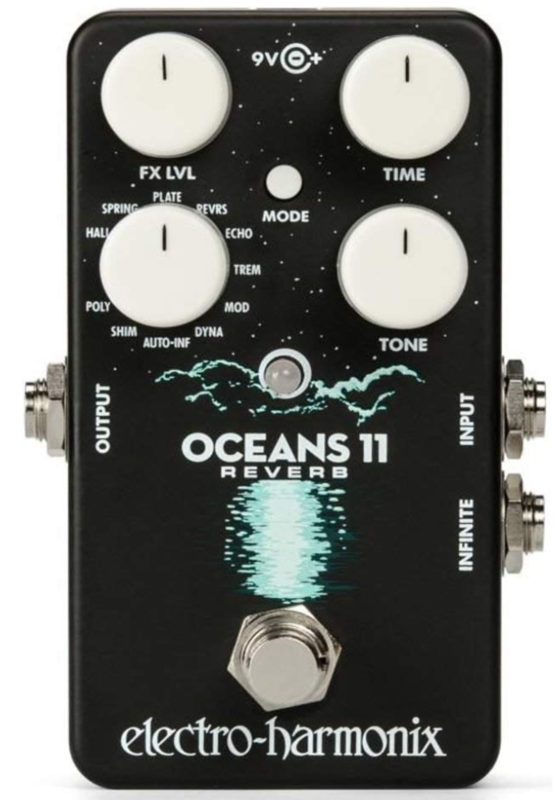 While not as realistic or as customizable as Source Audio’s True Spring or Ventris pedals, the Oceans 11 does have have a decent spring reverb “drip” and trail. The spring emulation on the Oceans 11 is more authentic than most other spring reverb pedals on the market. SolidGoldFX’s Surf Rider III is a very adjustable spring reverb pedal that is always musical and pleasing. It does not have a very splashy authentic reverb “drip”, in my opinion, but it always has a great tone and can connect to an expression pedal. It is based upon the “Belton” reverb chip and I think it may be the best of the Belton-derived reverb pedals on the market. 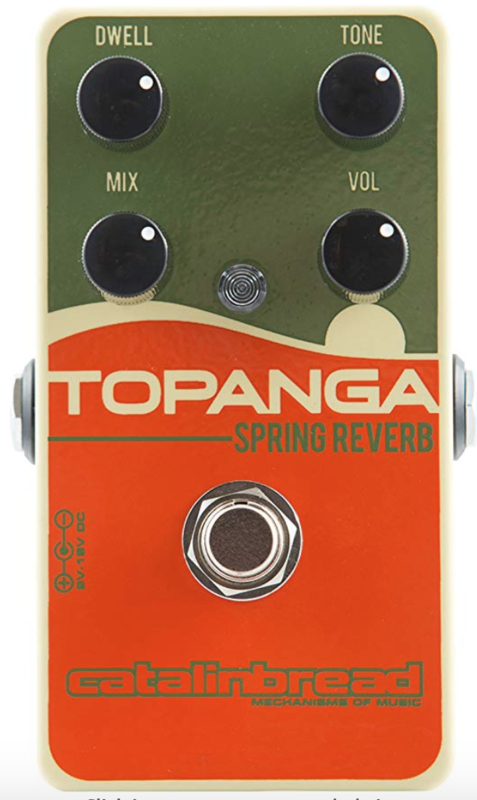 Catalinbread’s Topanga is a spring reverb pedal that is simple to use and sounds great. It is very faithful to your dry tone – unlike a real outboard spring reverb tank – and that can be a good thing depending on your needs. It does a reasonably good job at emulating an outboard spring tank’s bounce and trail and does a superb job at emulating an amp’s built-in spring reverb, except it just doesn’t have the most authentic “drip”. It has more of a slap-back echo which is a common symptom of a lot of spring reverb emulations. 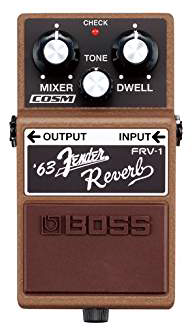 The discontinued Boss FRV-1’s is designed to emulate the ’63 outboard Fender Tube Reverb and its tube-powered preamp stage. It’s not a true bypass effect or one where your dry signal necessarily comes through unscathed. 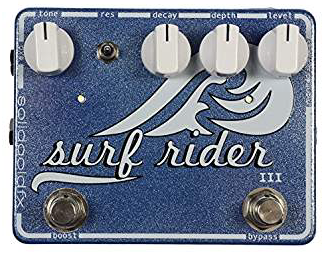 If you’re looking for a pedal that has a decent surf reverb “drip” in a mix, this may be a good option. However, it can easily get out of control and shrill at higher settings (just like some real outboard Fender units). To tone down the shrillness and to use it more like an amp’s built-in spring reverb, you have to lower both the mix and tone settings to 25%. 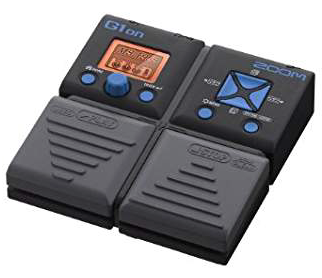 The Zoom G1on is a small affordable multi-effects unit with a lot of features. The G1on comes with a great spring reverb emulation called “Spring63” that can be dialed in very much like a real 1963 outboard Fender Spring Reverb tank. It can be overpowering and splashy for surf or dialed down like a warm built-in amp’s reverb. TC Electronic’s Drip reverb is a more affordable pedal but despite its name, it’s “drip” is not prominent or realistic and the reverb trail sounds processed. TC Electronic’s Hall of Fame reverb has a spring reverb setting but it is too subtle, too smooth and too “hi-fi” compared to an actual spring reverb.